Puerto Vallarta, in the state of Jalisco, and Riviera Nayarit, in the state of Nayarit, span over 200 miles of Mexico’s Pacific Coast. Home to some of Mexico’s most famous beaches, these are thriving regions with no shortage of fun water activities for all to take part in. See the top 4 water sports you won’t want to miss this summer! 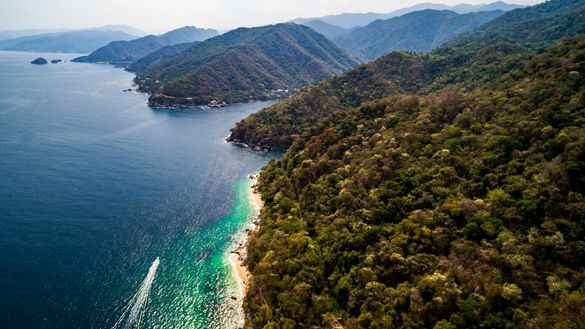 Diving: Puerto Vallarta offers some of the hottest diving spots along the central pacific coast and an underwater paradise for those who venture below sea level. June to October is low season for diving experiences, but this is a great time for beginners, with significantly warmer waters. Yet, experienced divers can venture out to Chimo, where you may be lucky enough to spy humpback whales and their calves until December. Meanwhile, Los Arcos National Marine Park is home to the deepest point in Banderas Bay, complete with caves and a flourishing reef. Divers can explore underwater caves, reefs teeming with tropical fish and see everything from turtles, octopus and sea horses, to dolphins, manta rays and more. Surfing:Surfing lessons around the region are readily available at very reasonable prices for beginners, making this a great family treat. Riviera Nayarit’s Punta de Mita, Sayulita and San Blas are year-round top spots for beginners to pro surfers, seeing visitors from all over the globe come to enjoy the destination’s quality break points and reef breaks. Lunazul in Sayulita is a must-try for quality lessons and the chance to enjoy top waves in the most beautiful hippie town. Chacala in Riviera Nayarit, where beaches are hidden and adored by locals, is also a hot spot for surfers. Sailing: Banderas Bay is also a premier sailing destination, and like so many of the other activities you can do here, there are excursions suitable for all skill levels. Unparalleled coastline, warm waters and friendly winds provide the perfect setting for your sailing getaway. Vallarta Adventures offers both private and group sailing charters on fishing boats, sailboats and catamarans for a number of memorable excursions. While away the evening on a sunset cruise, take in the night breeze and incredible surroundings of the destination, with cocktail to hand. Snorkelling: Another great way to discover these warm Pacific waters is to take a snorkel trip. Join a group of experienced snorkellers on a boat trip and explore this land of tropical eco-systems, stopping at secluded spots and coves along the way. Off Riviera Nayarit’s coast, the Marietas Islands are a National Park and UNESCO World Heritage Site offering many opportunities for exploration and adventure. It’s here you’ll find the ‘Hidden Beach’ – a secluded paradise of white sand and crystal-clear turquoise waters, reached only by swimming or kayaking. Book with Vallarta Adventures for a day to remember. The abundance of water experiences in both Puerto Vallarta and Riviera Nayarit are second to none. Too much to choose from? Book a 2-week direct stay, to enjoy Mexico’s Pacific Coast at its very best. Direct flights to Puerto Vallarta International Airport are available via TUI from London Gatwick and Manchester or AeroMexico via Mexico City from London Heathrow. British Airways runs direct flights to Dallas/Fort Worth, offering code share on its One World partner, American Airlines. Puerto Vallarta, in the state of Jalisco, is well-known for the preservation of its Mexican traditions. The destination spans Banderas Bay and comprises Marina Vallarta, Hotel Zone, Downtown (El Centro) and the South Shore. Each region offers a distinctive charm. Riviera Nayarit, in the state of Nayarit, lies just ten minutes north of the Gustavo Díaz Ordaz International Airport (PVR). This region includes the resort town of Nuevo Vallarta, the historic village of San Blas, celebrity hideout Punta Mita, surfing haven Sayulita, scenic fishing villages, miles of serene beaches and the spectacular Banderas Bay.